*Provided by immensely gracious patrons of the arts. A remote town in the Italian mountains where fog wreathes the summits and moonlight glimmers on Alpine lakes. When a local magnate, in trouble with the mob, buries his family fortune in a treasure chest in the mountains, he plans to tell his family about it the next day. But a hit man comes for him that night. Thus begins the legend of the hidden treasure in the mountains of Val Gardena. Many years later, the magnate’s widow is an embittered old woman, living alone in a stunning castle in the cliffs—the last, stony remnants of what was once a vast fortune. Her only child was kidnapped on the day of her husband’s death. Lonely and resentful, she buries herself in a life of shallow materialism. But when her great niece Grace, 8, comes from New York to live with her, everything changes. Grace is the sort of child her aunt detests. Tomboyish, clumsy, rowdy and adventurous, her life is a series of hilarious accidents, often spurred by her love of animals and her warmhearted desire to help people. When Grace hears the story of the lost treasure chest, she is determined to find it. With help from her aunt’s trusted advisor —a twinkling, funny, delightful man, modeled on the late Robin Williams—Grace sets out on a quest to untangle the mysteries of the past. But the journey to find real treasure may be more dangerous than she realizes. Many have sought the lost treasure in the mountains and never found it. Perhaps it takes an inquisitive child to see what no one else has seen. And perhaps it takes a child, whimsical and pure of heart, to realize a startling truth about the real meaning of treasure. The screen play for OTHER PEOPLE'S TREASURE has placed in many contests, including the Academy Awards' Nicholl Screenwriting Contest. As a result, I was fortunate enough to win option proposals from a number of film studios. But no one wanted to make the film the way I wanted to make it: with the original script -not altered to make it more commercial- and the original characters -not rewritten to star fourteen-year-old divas- and the original location ... Italy. So I've decided to produce it independently. 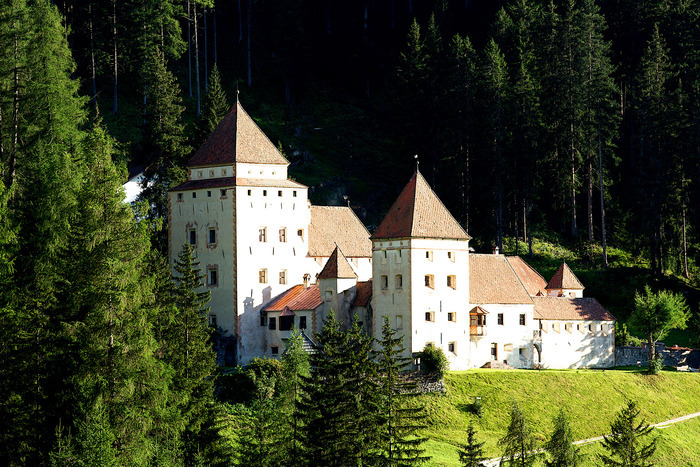 So far, we're looking good on the Italy front: the unbelievably gracious owners of a castle in Val Gardena in the Italian Alps, have given us permission to shoot Other People's Treasure there. The castle pictures on this site are the real location we will be shooting. It's absolutely magical. Now we just need to raise the funds for the rest of the film. By shooting on the RED camera -the same digital camera used for projects like HOUSE OF CARDS and GAME OF THRONES- we are keeping our budget incredibly low for a feature film. Our $300K budget will cover all expenses, including insurance, equipment, recruiting a 40-person cast, running enough generators to light a 17th century castle, etc. The exact budget breakdown for the film is included below, as is the timeline for production. If you have any questions, don't hesitate to ask. You can contact me via our Kickstarter page. Please enjoy the following excerpt! An ink blue sky lit by flaming white stars. Black mountains, drenched with fog, frame the water. From somewhere high in the mountains, a church bell rings, spurring a chorus of stony echoes. GRACE (voice over): They say he buried it by the water. 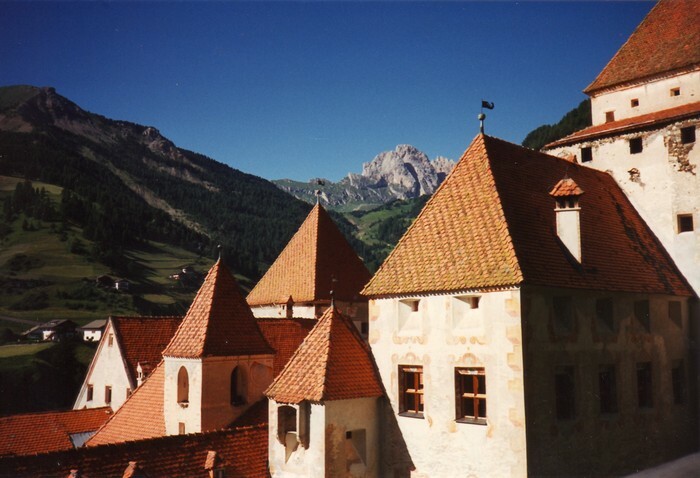 Majestic turrets soar above the cliffs, like smoothed out crags in the rocky mountainside. Marcello Lestri emerges from the castle tower, dragging the same chest we saw before. Lestri places the chest in a bobbing rowboat, anchored to a mossy stone. As he glides away, we move back into the woods, where a HOODED MAN is watching. A massive wooden door creaks open. Lestri stands in its frame, his costly clothes drenched in water. The chest is gone. A SERVANT helps Lestri into a heavy dressing gown. 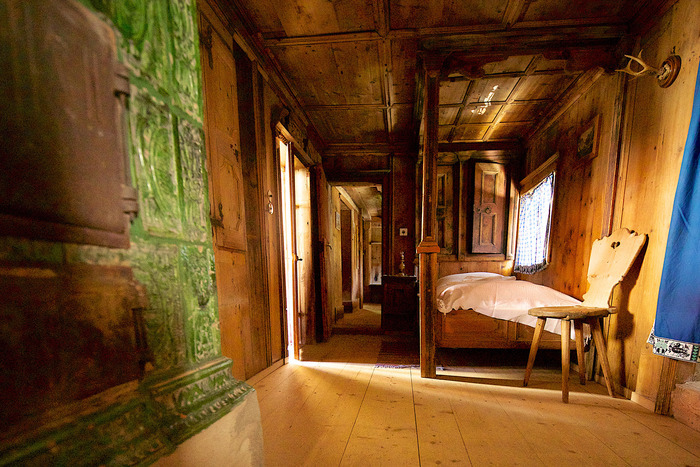 Lestri departs into a bedroom, where a woman is dimly visible on the bed, her arm flung across the pillows. The door closes. The Servant waits a moment, then opens a wardrobe, revealing the HOODED MAN. They look at each other. Neither one speaks. The Hooded Man moves toward the bedroom. As he opens the door, we see the GUN in his hand. GRACE (voice over): He never had the chance. Glinting water, same as before. Same dark mountains, same stars, but this time, NO BOAT. Gusts of fog puff over the lonely water like ghosts. GRACE (voice over): They say the chest is lost forever. We move slowly over the inky, black waves. GRACE (voice over): But I think they’re wrong. At first the water is dark, but suddenly, improbably, it changes to violet, then turquoise, then glittering azure. As we plunge down through changing colors, iridescent fish swim by. Glittering silver sea creatures stream across the screen. GRACE (voice over): I think it’s out there somewhere. A small HAND stretches into view, swimming down as we plunge through the lake. Silence. Stillness. We look down on the water from the same high angle as before, but now we can see we are looking through a second floor window. A gust of wind makes the sheer white curtains flap wildly. GRACE (voice over): And some day, someone will find it. A small hand darts out and yanks the curtain shut. Lights! Chandeliers! Whirling music! Compared to the ghost-like silence of the previous scenes, the small hotel party is alive with color and activity. We travel through clumps of well-dressed, American guests, catching bits of conversation, glimpses of silk and lace. FATHER : This is my oldest daughter, Viviana. FATHER, a tall man in an expensive tuxedo, shows off his daughter. VIVIANA, 13, is already exquisitely beautiful. FATHER (CONT'D): She’s a painter, she paints flowers. Do you like them? Father points to a display of small floral STILL-LIVES. The Guests murmur politely. FATHER (CONT'D) (proudly): She also plays the piano. MOTHER, a bony, middle-aged woman, too elegant to touch, skims along sheathed in silk. She holds a small DRESS. Mother opens doors, glancing into rooms. A child’s room with a canopy bed and a fort on the floor, constructed from chairs and blankets. IMELDA, a portly housekeeper, folds clothes. MOTHER: Imelda, have you seen Grace? IMELDA: Seen her! I just spent an hour getting her out of her play clothes. MOTHER: An hour? Is something wrong? IMELDA: Joe told her how they’re making the appetizers. IMELDA (CONT’D): Viviana was at piano practice, so there was no one to calm her down. MOTHER: But Imelda, if she’s not wearing her play clothes, what is she wearing? IMELDA: I sent her to you for her dress. They both look down at the DRESS in Mother’s hands. Close on a pair of shiny black SHOES. White lace SOCKS. Above the socks, instead of a dress, GRACE, 8, wears an oversized ORANGE LIFE JACKET that hangs to her knees. A snub-nosed, scruffy girl, eyes red from crying, she lies on top of the refrigerator, tying a hook to a home-made FISHING ROD. The door opens. Grace tenses. COOK, a fat woman with a large hearing aid, waddles in. She sets a pan on the counter and bustles back into the pantry. Inside the pan are five LIVE LOBSTERS. As their beady eyes shift nervously back and forth, a HOOK dangles slowly into the frame. On top of the fridge, Grace manipulates the rod. GRACE (in a whisper): It’s okay, little lobsters. I’ll save you. Grace expertly HOOKS a lobster by the band around its claw. Looking as surprised as a lobster can look, it rises into the air. GRACE (CONT'D) (whispering): No one’s going to boil you alive. Grace snatches the Lobster off the hook and jams it into an empty VIOLIN CASE, just as Cook enters. Cook bustles around. Reaches the pan. Frowns. Muttering to herself, she waddles out of the kitchen. We stay with Cook as she waddles outside, down the steps, to a barrel of lobsters by the dock. She selects one. Cook re-enters, puffing. As she prepares the new lobster, Lobster Number 5 rises into the air behind her. Cook turns back to the lobster pan and finds it- empty! She looks up. Grace is leaning over the side of the refrigerator, reeling up an Italian pastry on her fishing line. Scolding, Cook waddles across the kitchen for a bamboo rod in the corner. Grace hastily crams the pastry into her mouth and scrambles down. Grace bursts into the elegant party. Guests near the door stare at the odd little girl in the life jacket. Grace edges cautiously along the wall. An OLD MAN with thick glasses swoops down on her. OLD MAN: Well, well! If it isn’t, Francis’s youngest. What’s your name again, child? Grace? Grace’s mouth is crammed too full to answer. She nods. OLD MAN (CONT’D): Ha! I knew I’d remember if I tried. And how old are you? Grace glances around, desperate. She holds up seven fingers. OLD MAN (CONT’D): Five years old! Well, you’re getting to be a very big girl, aren’t you? OLD MAN (CONT’D): Your sister has been showing off her talents. Tell me, what are yours? Grace can’t think of a way to answer. She backs up slowly into a large vase, which tumbles to the ground, along with Grace and the violin case, which bursts open. LOBSTERS crawl everywhere. OLD MAN (CONT’D): Dear me! Lobsters. A Woman descends on the Old Man and whisks him away, not noticing the lobsters. Hastily, Grace spits her pastry into a woman’s SILK HANDBAG, sitting beside a chair. She scrambles around, collecting lobsters. Just as she has shoved the fourth one in her purse, she looks up and sees the FIFTH LOBSTER, crawling along the back of a sofa towards a Lady’s elegant, pearl-trimmed NECK. Grace’s eyes go wide. She stuffs the lobsters in the vase and crawls as fast as she can for the sofa. The Lobster is inches from the Neck when a hand lands on Grace’s shoulder. AUNT JANE: So here’s my niece! Where have you been hiding? AUNT JANE pulls Grace to her feet. AUNT JANE (CONT'D): Grace. Dear. What are you wearing? A SCREAM interrupts them. The Lobster has gone down the Neck. The OWNER OF THE NECK jerks her hand into the back of her dress and FLINGS the Lobster across the room, SHRIEKING. The Lobster lands with a splash in the PUNCH BOWL. Guests, not seeing it, try to soothe the apparently hysterical Owner. OWNER OF THE NECK (sobbing): It was some sort of crustacean! As people comfort the Neck, Grace crawls under tables, weaves through crowds, to the punch bowl. She looks around. No one seems to be looking. She sticks her entire ARM in the punch. Juggling the dripping, slippery lobster, which flaps its tail wildly, Grace ducks under the table, breathing hard. After regaining her composure, Grace lifts the edge of the tablecloth and peers out. Across the room, a Servant picks up the fallen vase. Looks inside. Rushes to the Kitchen. Cook comes out. He hands her the Lobsters. Scolding, she takes the vase firmly in hand and carries it into the Kitchen. The shore is deserted. Moonlight spills over the water like milk. Grace stands at the water’s edge. Kicking off her shoes and socks, she steps in, placing the Lobster sadly on a rock. GRACE: Maybe you’ll find a new family. The Lobster clambers away over iridescent rocks. Grace looks longingly out at the water. GRACE (CONT'D): If you find any treasure out there, come back and tell me! Something in the water catches her eye. She leans forward. The thing is small, glittering. Purple. Oval in size. Could it be ... a jewel? Moonlight catches on its sparkling body and it undulates gently. A JELLYFISH. Grace leans forward, mesmerized. She reaches for the jellyfish. WHAM. A fishing net SLAMS down between the jellyfish and Grace’s hand. Frightened, Grace looks up ... up ... up, into the eyes of OLD BENITA, a hunched old woman standing ankle deep in the water. Tattered overalls flutter around her withered calves. Her skin is deeply tanned, crossed with intricate wrinkles. OLD BENITA (in Italian): Don’t touch the jellyfish. Old Benita makes one deft, twisting motion with her net, and scoops up the jellyfish Grace wanted. OLD BENITA (CONT'D): My jellyfish. To be continued … hopefully on a screen near you one day soon! The budget for this film is $300,000. Here is a breakdown of how the funds will be spent. If you have any questions, don't hesitate to ask. We are currently in Preproduction, when we plan the project and raise funds. We have finalized the script, planned our production schedule, and arranged major discounts on film equipment in Italy. We’ve already completed the first stages of preproduction. The Italian Film Commission has been beneficial in helping us plan the shoot, and putting is in touch with equipment rental facilities, casting agencies, etc. Now (clearly) we're working on fundraising. We hope to raise the minimum funds needed to make a great film ($300K) by the end of this campaign. If we reach our goal, we will continue to apply for additional film grants from the Italian government, to make the film even more compelling and visually rich, but we’ll know that we can proceed with our budget covered either way. From there, we’ll put together our filmmaking team: cinematographer and camera department, gaffer and electrical department, production designer and art department, etc. Each film department will break apart the script, creating a shooting schedule, production boards, storyboards, shot lists, costume designs, etc. From there, the planning continues. Preproduction for a film is basically like organizing a two-month voyage to the Arctic, or a really, really complicated wedding: planning, planning and more planning. If you have any questions about the process, don’t hesitate to ask! This is the fun part. We shoot the film. We hope some of you will join us on set to experience the most exciting part of filmmaking. Once we have the raw footage and sound captured in production, the next step is to put it all together. In postproduction, we’ll weave all the individual pieces of the film into a beautiful, cohesive whole, complete with music, color correction, sound effects, etc. When the film is ready, we’ll enter it in film festivals … and share the finished product with our wonderful backers! Casting for this film will begin in February. In the meantime, have a seat in the director's chair … tell us whom YOU would cast in the main roles! A major part of directing is finding the perfect actors to bring a role to life. We all know an actor, or someone who ought to be an actor, or someone we've seen and loved in a theatrical or indie film production, whose career we'd like to promote. Read about the major roles and send us your recommendations for whom we should cast. Perhaps you'll discover a star! On a similar note, if you envision a television or film star who is already known, who would be perfect in one of the roles, send us your suggestions! If enough people mention a specific star, we will do our best to get in touch with him or her. As mentioned in the video, we won't contact stars who aren't right for the part … but sometimes even extremely successful actors will take part in a low budget film if a role truly is perfect for them. Thank you for your suggestions! Following is a list of the three major stars in OTHER PEOPLE'S TREASURE. To email us suggestions for whom to cast, scroll down to the bottom of the page, click “Ask a Question,” and email us your thoughts! Age 60-70. A countess who lives alone in a castle, haunted by memories. Her only child was kidnapped as an infant, and her husband was killed by the mob after burying his family fortune in the mountains. Once stunningly beautiful, Aunt Giulia has collapsed into herself, feeding off of old memories and an odd combination of religion and vanity. A complex, bitter character, with a strange ability to surprise us. Age 30-60. Oddly enough, the age for this character doesn’t matter … The important thing is that he is a driven, passionate, single-minded priest, entirely consumed by his obsession with helping the poor … Yet in spite of his fixation, he is funny, witty, intelligent and utterly charming, a complex villain who wins our hearts, and then terrifies us. Age 8. A funny, rowdy, tomboyish little girl, Grace can’t please any of the adults in her life, from her frivolous parents to her Great Aunt Giulia, who tries to adopt her. Curious and daring, Grace stumbles into adventures and accidents at every turn … which makes her the ideal person to find the long lost treasure.